Happy Sunday! I hope you're having a wonderful weekend! I looked through my Christmas card stash and realized it's still pretty low, so I decided to work on some holiday/Christmas cards while I'm in the mood. This card is for Sparkle's Christmas Card Challenge #38. I followed her lead and used Taylor's sketch #77 from a couple of weeks ago. I hadn't played with it yet, and it's a fun one! I thought it fitting to use one of the many fun images that Sparkle stamped off and mailed to me recently! Thanks so much, Sparkle! Enjoy what's left of the weekend! Thanks so much for stopping by! 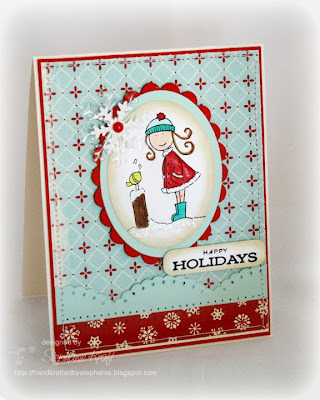 Accessories: Oval, Scalloped Oval and Rounded Tags (Spellbinders); Markers (Copic), Diamond Lace border punch (EK Success), Snowflake punch (Marvy), Snowflake ghost shape (Heidi Swapp), Pearl (Kaisercraft), Star Dust stickles (Ranger), Foam Tape, Thread, Sewing machine. I'm glad you're having fun with the Elzybells. Your card is just darling! Adorable! I love the colors in this! !